Todd Lamb, Oklahoma’s lieutenant governor, isn’t at the Capitol much. Now in his second term, Lamb, a Republican, has spent a good portion of his tenure as second-in-command traveling across Oklahoma or out of state. 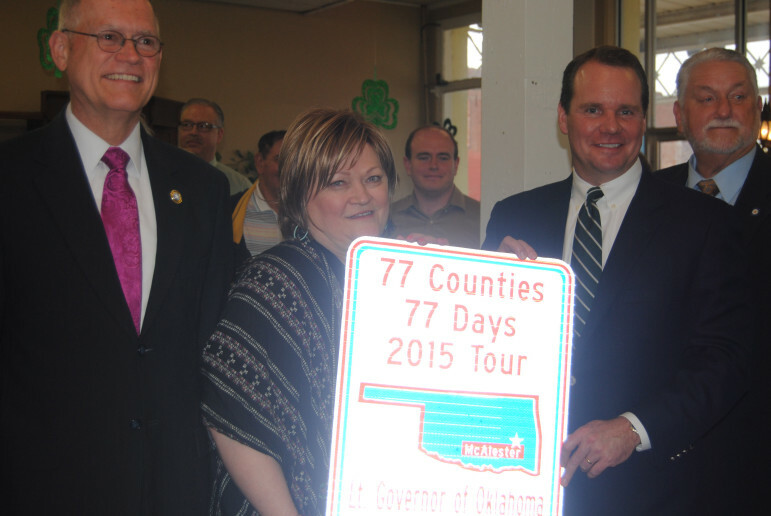 He just finished his fifth tour as lieutenant governor in which he visited 77 counties in 77 days. The quip and Lamb’s tour point to how the office of lieutenant governor allows a person to travel the state and give speeches and shake hands extensively like a political candidate, while on the state payroll. That’s been the case for years with Republican and Democratic lieutenant governors. Lt. Gov. Todd Lamb (center right) receives a sign presented by the city commemorating his recent 77-county tour. McAlester Mayor Steve Harrison (left), city grant writer Pam Kirby and state Sen. Larry Boggs, R-Red Oak (right), were on hand. Keith Beall, Lamb’s chief of staff, said the trips benefit the state and its residents because Lamb meets face to face with citizens about their concerns. Since 2011, when he became lieutenant governor, Lamb has also released several policy books that Beall said were based on the information Lamb gathered while traveling. Lamb has also made several out-of-state trips to the National Lieutenant Governors Association conference, held in Washington, D.C., Las Vegas and San Juan, Puerto Rico. In March 2012, Lamb traveled to Dusseldorf, Germany. A spreadsheet provided by Lamb’s office shows the $8,294 trip to the Webco-Steel Tubing International Show was paid for by the Business Roundtable, an economic development group in Oklahoma City. Beall said the organization has paid much of the $23,595-plus spent on Lamb’s out-of-state travel. Beall said one reason for Lamb traveling the state is that he gets from 20 to 35 speaking requests per week. The spreadsheet shows the lieutenant governor visited 175 places in 2014, a majority of which were speaking engagements. Lamb is usually accompanied by a staff member and a Department of Public Safety security detail. He does most of his in-state traveling by car, Beall said. In January 2014, Lamb traveled 12 times, including a trip to Grapevine, Texas, for an Oklahoma State University football game and three trips to Enid for speaking events. Lamb made 16 in-state trips during February and another 18 trips in March. He traveled 14 times in April and 13 times in May. Last June, records show Lamb made 20 trips, including a three-day tour of the Panhandle with stops in Guymon, Boise City and Beaver. Lamb also went to Krebs for a Chamber of Commerce meeting and spent four days in Aspen, Col., at the Aspen Institute, an education and policy studies organization. That trip was paid for by the institute. Lamb also made five trips in July, 10 in August and 31 in September. He traveled 27 times in October, seven times in November and four times in December. “It’s all about talking to people and finding out what their issues are,” Beall said. Only a small amount of the in-state travel costs comes out of the lieutenant governor’s budget. 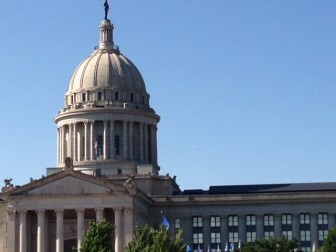 Most of those costs, as well as those of the governor, are covered under the DPS budget. Records show DPS spent $485,559 on travel in fiscal year 2014 and $249,183 in fiscal 2013. The records don’t break out how much was spent on travel by Lamb’s office. Last year, state travel costs topped more than $100 million. Earlier this year, state finance secretary Preston Doerflinger complained that agency travel budgets had grown too large. Reducing travel costs could help free up money as lawmakers try to backfill a $611 million budget hole, he said. Beall said in light of the budget crunch, “everything was on the table” regarding travel cuts. Gov. Mary Fallin declared a state of emergency today for 25 counties affected by Wednesday’s tornadoes, her spokesman Alex Weintz confirmed.